A fall wedding reception provides opportunities for table setting decorations that play up seasonal colors and motifs. The fall wedding decorations can be simple with colored leaves at each place setting or more elaborate decorations to coordinate with the wedding colors and natural beauty of autumn. An easy way to incorporate fall décor into your wedding table settings is with autumn placemats in appropriate colors. Reds, yellows, and golds are popular shades for fall weddings, not only for table linens but also for plates, napkin rings, and cutlery. Adding a simple table runner in a fall hue is a great way to turn a plain wedding table into an autumn setting. Bursts of fall color in centerpieces or floral arrangements can set off the seasonal colors even more. Creating a bold fall wedding palette for the reception tables is easy with colored linens. Rich, dark tablecloths can be highlighted by lighter table runners and other accents, and coordinating napkins and dishes offer a stark contrast and bold palette for tables set for fall weddings. Simple fall accents can turn a basic table setting into a fall themed decoration. Instead of white napkins, choose a neutral fall color such as a pale beige or tan and use an orange, yellow, or red flower as a focal point for the napkin ring. Similarly, brightly colored leaves or ripe grains can be lovely fall accents for a simple table setting. For the best fall wedding decorations, look beyond the table and include chair decorations in fall colors for a formally coordinated look. White chair covers are easily accented with sheer sashes or bows in fall colors, or choose dark wood chairs that have warm fall tones without needing covers. Fall wedding floral arrangements are essential to classic wedding reception decorations. Brown, orange, yellow, and red blooms accented by hints of green and gold will give a warm autumn burst of nature to any table, and adding candles is a romantic and seasonal way to augment the ambient lighting of the reception. Fall is a time of bountiful harvests, and using fruit as a decorative accent is a unique way to personalize your fall wedding tables. Grapes, apples, and pears are popular fall choices, while citrus fruits, small pumpkins, Indian corn, and gourds are also fun options that can be stacked in tiered serving dishes, added to floral arrangements, or used in a themed cornucopia. 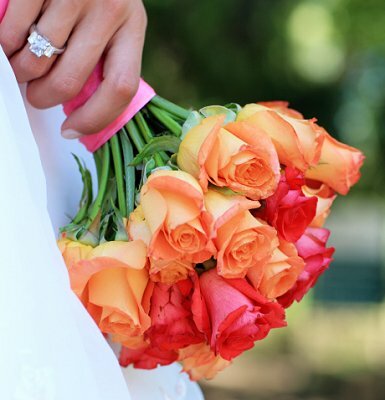 Bold colors are characteristic of fall weddings. Instead of opting for predictable white dishes, choose colored plates in fall hues that coordinate with colored napkins for instant fall ambiance in your décor. Gold is a popular accent color for fall weddings because it matches well with many bold fall shades. Use gold candleholders, tinted glasses, and other decorative details to bring a bit of rich, romantic glitter to your wedding tables. Let Mother Nature help with your decorating by arranging your wedding tables to have outstanding views of autumn scenery. Vineyards, forests, and fields are all lovely options that can add a sense of seasonal beauty to your event, depending on your wedding location. Fall wedding table centerpieces often take advantage of nature's beauty with river rock, colored leaves, gourds, pumpkins, and rich seasonal colors. Even a simple centerpiece can be bold when used on a dark tablecloth that evokes the glory of the season. Even the food you offer on your wedding reception menu can be part of the beauty of your fall tables. Hearty soups, crusty breads, fragrant wines, and roasted meats are all popular foods for fall weddings and will add seasonal scrumptiousness to the table. When designing your fall wedding tables, don't forget seasonal accents for the cake table. Colored linens, scattered leaves, and a fall floral backdrop will ensure your cake has a place of honor in the reception decorations.